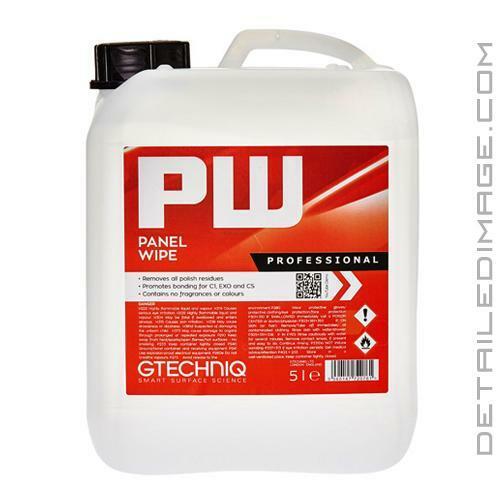 The Gtechniq PW Panel Wipe is specifically formulated to remove oils and other residues from surface, prepping them for any coating application! Many times polishing oils and residue can negatively effect the way sealants, waxes, or coatings bond to the surface. PW is designed to remove all these oils and residues so that semi-permanent coatings, such as C1 Crystal Lacquer and EXOv2 Ultra Durable Hybrid Coating, can form a durable bond with your vehicle's paintwork. Simply spray PW directly onto a clean microfiber towel and wipe away, it is that easy! The unique blend of pure alcohols and aromatic solvents are formulated specifically to give adequate working time to remove and dissolve polish residues. PW will then evaporate to leave a 100% decontaminated surface! If you are looking for a surface that is truly clean and ready for any form of protection, use the Gtechniq PW Panel Wipe! Gtechniq Panel Wipe is designed to remove all polish residues so that ultra durable chemically bonding coatings such as C1 Crystal Lacquer and EXO can form the maximum amount of bonds with your vehicle's paintwork. PW is a blend of pure alcohols and aromatic solvents formulated specifically to give adequate working time to remove and dissolved polish residues and then flash off to leave a 100% decontaminated surface. Love that stuff. Use it always before I put any sort of wax or sealant. Does not take away any shine and shows you what you missed. Seemed to work great. it left a clean surface and did not lessen the gloss. This is the best polishing oil remover I've used. You can clearly see the difference between this product and even Eraser. Your responsiveness was certainly not typical of what I'm used to!